Define what living once means to you! Money isn’t a goal—it’s a resource you need to live the life you see for yourself, and You Only Live Once shows you how to efficiently use your wealth to create and sustain the lifestyle you want. You Only Live Once is a national bestseller, Amazon bestseller and top business book by 800-CEO-Read. It was reviewed by the New York Times, a recommended read for psychologist on PyschCentral, and rated by the Financial Posts as one of the top 5 best personal finance book of 2016. Do you think money is evil? Do you believe money cannot buy happiness? If you want to rediscover your passions and define your purpose, You Only Live Once is your complete guide to understanding your money mindset and teaching you to manage money with a purpose—to live your dream lifestyle in this lifetime. Through my personal story of how I redefined the way I see money to live a more fulfilling life, I share memorable lessons learned to motivate you to create a lifestyle budget, save purposefully, spend consciously, and rethink retirement. The term, you only live once, has been around for hundreds of years. I wrote this book to inspire and give you practical skills to get you to invest your most valuable asset – time – to improve your financial situation and improve your life. You Only Live Once is your opportunity to change your mindset to help you achieve your financial and life goals. "Jason's approach to money is hopeful and energetic. If you're tired of money controlling your happiness and feeling hopeless about your finances, this book will help to shift your mindset from scarcity to abundance." You Only Live Once redefines the millennial mantra into a practice of mindful financial decision-making to engineer your dream lifestyle. Awareness: Understand your financial starting point and learn to envision your destination. Creating a Plan: Build the roadmap to achieve your financial and life goals. Taking Control: Learn to spend mindfully, save purposefully, and fix the debt mindset. This book will inspire, motivate, and give you practical skills to achieve financial goals and live purposefully. Available in hardback, ebook, and audio. "Ride along as your guide Jason Vitug shares his truly inspiring story and his practical tips for living a more intentional financial life." "One of the founders of the credit union movement, Edward Filene, once said 'keep purpose constant.' 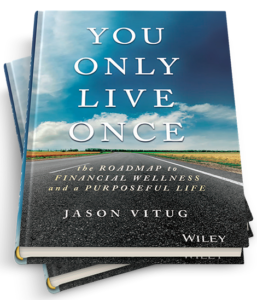 Purpose drives the credit union system and keeping it central to your own personal financial life is vitally important as well, which Jason hits home in this book." 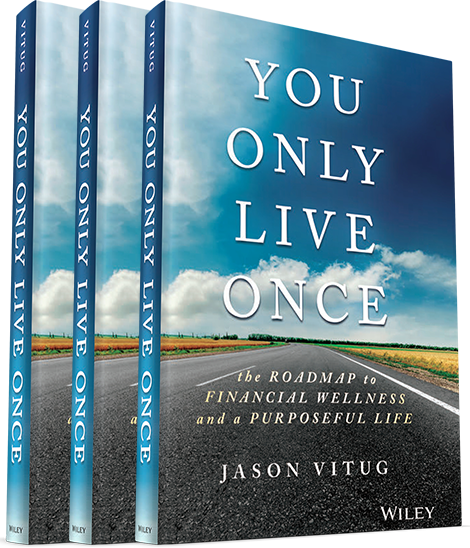 "You Only Live Once is an essential money and life guidebook to help you improve your relationship with money and create a wealthy and purposeful life. Jason's story is incredibly inspiring." Have a success story? Want to comment, send praise or feedback about You Only Live Once? Leave a review on Amazon.com and help others discover the book. Leave a review on Goodreads.com and help others discover You Only Live Once.